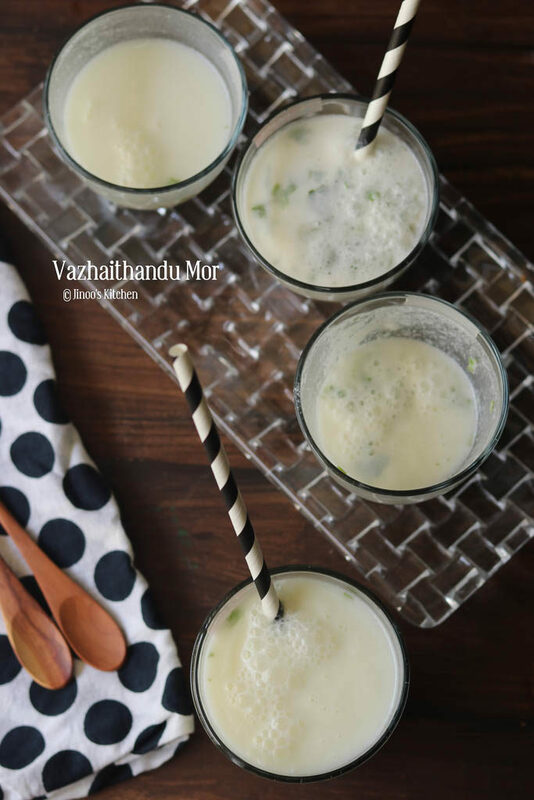 Vazhaithandu Mor recipe | Banana stem buttermilk recipe with step by step photos and video recipe. simple, healthy drink to beat the heat in a healthy way. 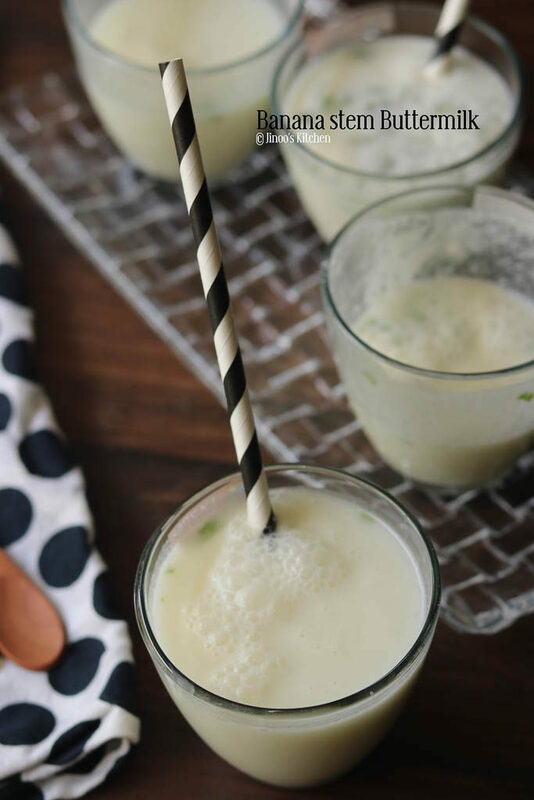 Banana stem is known for its benefits and adding the spiced banana stem juice to the very regular buttermilk takes it to a whole new level. Spiced vazhaithandu mor has become most favourite in my home and i could easily impart the benefit of banana stem in my familys’ diet ! I had already posted the Neer mor recipe from scratch and panakam last summer and that is how mostly we store buttermilk at home which is fat-free and butter removed. very thin, light and perfect replacement for water. This is anyhow done with churning the curd. After blending the curd with salt and water, You can also filter the buttermilk with muslin cloth or cloth strainer to remove frothy layer from it. Blend curd, salt and 1.5 cups water. Transfer the buttermilk to a bowl. In the same blender, take the chopped banana stem, cumin seeds, green chilli and ginger. Blend it finely. strain the juice out of it and add it to the buttermilk. Lastly, add chopped coriander leaves and torn curry leaves. Mix well and serve. 1.Blend thick curd and salt for 8-10 seconds until smooth. 2. Add 1.5 cups water or even more as per the consistency you prefer. Blend it again for a few seconds. Transfer the buttermilk to a bowl or jug. 3. 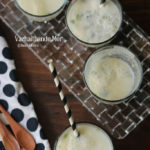 Chop the banana stem and reserve it in the buttermilk until use. squeeze and take out the chopped banana stem along with green chilli, cumin seeds and ginger. Add a cup of water and blend it finely. Pour it through a strainer onto the prepared buttermilk. 4. Squeeze the juice out of it. If required use hands to squeeze the extract fully and discard the residue. 5. Finally add chopped coriander and broken curry leaves. Mix well and serve fresh. I used Chilled Curd so that i can have it fresh and chill. So here is the Banana stem buttermilk ! Easy right?